A Hawaiian getaway at Sheraton Kona Resort & Spa at Keauhou Bay will be an unforgettable experience! This soothing sanctuary boasts tropical charms and exotic luxuries, sumptuous accommodations, tantalizing cuisine, an array of thrilling activities and a place of peace and calm in the spa. Exploring the enchantment and mesmerizing beauty of the islands on this Hawaiian holiday will be a wonderful gift! With your lovely gift, the trip of a lifetime will be experienced at Sheraton Kona Resort & Spa at Keauhou Bay! Here, the true essence of the islands will be discovered with lush natural beauty, pristine beaches, sparkling waters and the welcoming spirit of "Aloha". Sheraton Kona Resort & Spa boasts enchanting accommodations, world-class restaurants, thrilling activities and a world of tranquil bliss in the spa. A stay at Sheraton Kona Resort & Spa at Keauhou Bay will be an exceptional island getaway that is just as alluring as it is mesmerizing! This Hawaiian vacation at Sheraton Kona Resort & Spa at Keauhou Bay presents an Unforgettable Massage for Two! In the tranquil settings of Ho'ola Spa’s exclusive terrace, we will sit back and relax in the nourishing essence of a luxurious whirlpool bath. While lying side by side, we will then be pampered with a customized massage, combining essential oils of the islands and soothing massage strokes. Thanks to you, we will discover pure bliss! A bottle of champagne delivered to the room on this Hawaiian vacation will be the perfect gift! While taking in the stunning views from the balcony, a toast will definitely be in order! 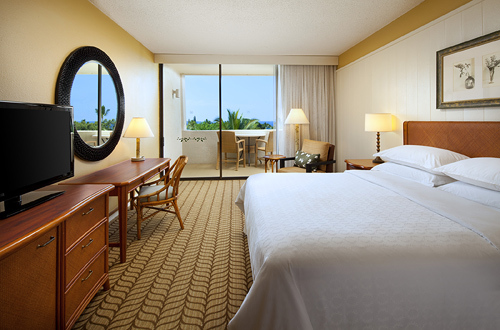 Sheraton Kona Resort & Spa at Keauhou Bay offers a cheese platter that will be delivered to the room! This savory treat includes a variety of international, rich cheeses that will delight the palate. Thanks to your wonderful gift, a decadent treat will be enjoyed from the comfort of the suite on this Hawaiian vacation! A platter of fresh, sumptuous strawberries covered in rich, exotic milk chocolate will be delivered to the room for the ultimate indulgence in paradise! A lavish healing massage is the perfect gift for this Hawaiian getaway at Sheraton Kona Resort & Spa at Keauhou Bay! Warm volcanic river stones will be placed on key points of the body while essential oils are massaged all over to achieve deep relaxation. The heat from the stones will penetrate deep into the muscles, leaving an energized feeling that is free of stress and tension! A Lomi Lomi Hawaiian Massage on this island getaway at Sheraton Kona Resort & Spa is a wonderful gift. In the soothing settings of Ho'ola Spa long, rhythmic strokes incorporated with fragrant essential oils will awaken the senses and relax the body. The Lomi Lomi Hawaiian massage will ease muscle tension and stimulate blood circulation to promote a healthy state of mind! The Pikake Package offers the chance to indulge in a delightful spa experience in the serene surroundings of Ho'ola Spa! This includes a soothing therapeutic massage of choice and an invigorating customized facial. With the Pikake Package, senses will be awakened at Sheraton Kona Resort & Spa at Keauhou Bay! With your thoughtful gift, a Red Wine & Cheese Platter amenity on this island getaway will be enjoyed. Divine red wine and a cheese platter consisting of international cheeses will be delivered to the room. It will be indulgence at its finest! 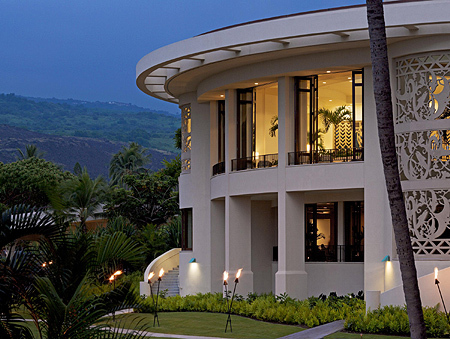 Sheraton Kona Resort & Spa at Keauhou Bay offers the ultimate indulgence in Ho'ola Spa! The Serenity Package includes a therapeutic massage of choice, followed by a customized facial and a warm paraffin pedicure. The Serenity Package will leave the mind, body, free spirit and soul in a tranquil state of bliss! This Hawaiian Island getaway at Sheraton Kona Resort & Spa at Keauhou Bay will be enhanced with the Tropical Fruit Platter. A platter of fresh, luscious fruit will be delivered to the room to be enjoyed. The medley of the island's sweet and sumptuous fruits will be an exceptional gift! It will be fun snorkeling and discovering dolphins on this sailing adventure. After snorkeling among tropical fish and other amazing kinds of marine life, it will be time to sail through the pristine waters of the Pacific Ocean. Admiring the stunning coast and coming across friendly, playful dolphins will be the highlight of this exciting adventure! The Big Island Grand Circle Island Tour in Kauai will be an exciting experience. Led by a tour guide, this tour includes a walk through lush coffee country, dense tropical rainforests and all the way to the rim of Kilauea caldera. On this island tour there will be an opportunity to admire incredible views and explore around Volcanoes National Park. At Sheraton Kona Resort & Spa at Keauhou Bay it will be exciting to take part in the Big Island Helicopter Spectacular - Kona adventure. This helicopter tour includes flying high over Kauai to see a bird's eye view of the stunning coastline, lush mountains, magnificent volcanoes and cascading waterfalls below. Thanks to you, the Big Island Helicopter Spectacular will create unforgettable memories! With your thoughtful gift the Zipline through Paradise will create unforgettable memories! This thrilling adventure includes soaring high above lush foliage, winding streams and cascading waterfalls on nine amazing ziplines. Viewing Kauai's breathtaking surroundings from a bird's eye view will definitely be a highlight. This one-hour walking and one-hour canoe tour will go back in time to tell the myths, legends and history of Keauhou Bay and the Kings and Queens that once lived there. This will be the educational experience of a lifetime! Touring the historic 5.5 acre coffee farm, D. Uchida Farm, will give all who visit a firm understanding of the daily lives of early Japanese immigrants from 1920-1945. Walking through the coffee and macadamia nut orchards, touring the historic farmhouse, and interacting with the donkeys and chickens presents an eventful day! This once in a lifetime experience boasts an incredible journey through a range of ecosystems and climate zones before viewing an active volcano. Seeing the amazing power of lava in person will be truly unforgettable! The Travel Channel calls it “One of the top-ten things to do in your lifetime.” Experiencing the beauty of these creatures up close and personal will be an experience to cherish. 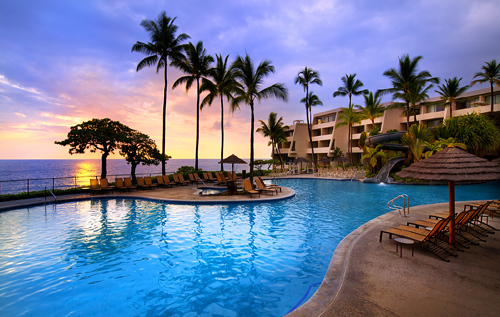 Soon it will be time to indulge on a Hawaiian vacation at Sheraton Kona Resort & Spa at Keauhou Bay! The Ocean View Room is beautifully designed with a fresh spread of rich creams, dark tropical hardwoods and fine furnishings. This heavenly hideaway features a king size 'Sweet-Sleeper' bed with delicious linen bedding, decadent bathroom amenities and a private lanai with majestic views of the alluring Pacific Ocean! Crystal Blue is an exquisite place to indulge in a round of drinks and light snacks. While admiring breathtaking views of the Hawaiian sunset and the legendary "green flash", Crystal Blue offers an international selection of beers, premium wines, tropical concoctions, classic cocktails and sumptuous appetizers! 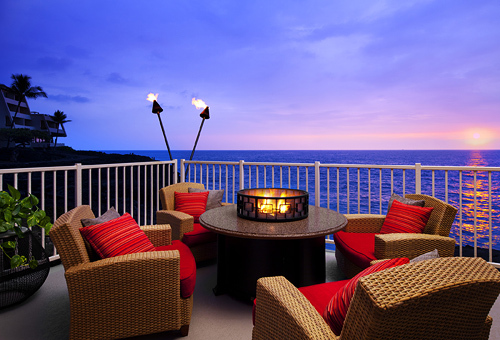 A romantic dinner for two beneath a star-studded sky is a wonderful gift for this Hawaiian getaway at Sheraton Kona Resort & Spa at Keauhou Bay! While the glowing sun sets below the sparkling water's horizon, we will dine bay-front while tantalizing our palate with sumptuous cuisine and enjoying the exclusive services of our own personal butler. Thanks to you, we will indulge in our favorite drinks while admiring the moonlight dancing off the waves for the ultimate luxury in paradise! The Firenesia Luau Dinner Show provides mesmerizing entertainment on this Hawaiian getaway. The dinner includes Hawaiian favorites like kalua pork, poi and lomi lomi salmon accompanied by crisp salads, fresh fruits and decadent desserts. After dinner, a vibrant show with Polynesian song and dance will take the whole audience on an amazing journey of inspiration and legendary tales! Ainakai's cuisine will tantalize the taste buds with sumptuous dishes. This charming restaurant boasts bountiful breakfast favorites accentuated by tropical fruits and juices. 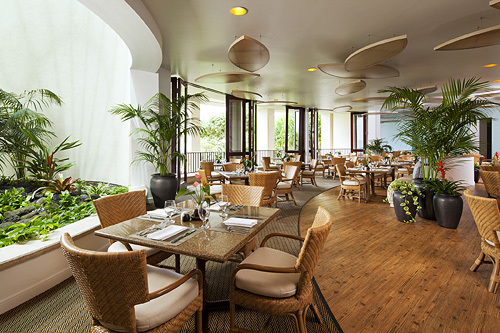 For dinner, Ainakai offers an array of fresh seafood specialties and cuisine with a fusion of the many flavors of Hawaii. Thanks to you, it will be easy to dine in an elegant yet laid back setting while enjoying the stunning views of Keauhou Bay and the Kona Coastline! The poolside Rays on the Bay offers laid back charms! The menu features fresh sandwiches, crisp salads, flavorful wraps, sumptuous smoothies and tropical concoctions that can all be enjoyed in a relaxing atmosphere.